When we began BabySparks, research showed that 700-1,000 new neural connections were formed every second during a child’s early years. We were impressed. But new research shows that number is actually 1 million neural connections per second! This underscores our mission to empower parents and childcare professions with tools to support, enhance, and track development in the early years. Here’s why those neural connections matter, and what it means for you. Everything we do, from breathing to interpreting a person’s mood based on their behavior, is controlled by cells in our brains called neurons communicating with each other. When we reach for a cup, for instance, neurons responsible for voluntary movement talk to each other to make it happen. 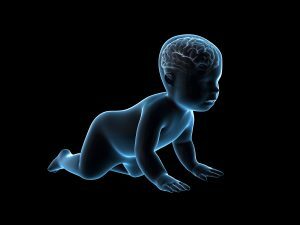 During the first three years of life, a child develops neural connections at that incredible rate of 1 million per second. Whether or not these connections thrive or weaken creates what the Harvard University Center on the Developing Child calls “the architecture” of your child’s brain—a foundation with lasting effects on his future. What determines the fate of neural connections either thriving, weakening, or even disappearing is whether or not they’re activated. Every time you talk to your child, for example, neural connections responsible for language begin to fire. The more they’re activated, the stronger they become. This is why babies and toddlers who hear more words develop better language skills. The opposite is also true; if a child is rarely spoken to, language-related neural connections weaken and long-term language skills are at-risk. This process of “pruning” neural connections happens throughout our lives but at a much faster rate and with longer-lasting effects during the early years. As an adult, for instance, you can train your brain to be happier, but it requires consistent focus and practice. It’s significantly easier for happiness-related neural connections to be activated and strengthened when we’re young. During this period of rapid brain development, your child’s brain is like fresh play dough, soft and easy to shape. Over time it becomes less fresh and harder to mold. This means you are in a unique position to help shape your baby’s brain. One of the most important ways to do this is through meaningful back-and-forth interactions called serve and return. If you’re doing a variety of BabySparks activities with him, you’re engaging in serve and return and stimulating neural connections related to every area of his development. Your child’s future is based on an interplay of genetics and environmental influences. Both matter, but ongoing research makes clear that the role of environmental influences cannot be underestimated. In fact, growing attention to epigenetics (gene modifications) shows that genes can be turned on and off based on environmental input. Knowing that the first years of a child’s life are critical for brain development highlights the importance of early intervention for suspected developmental delays. In the past, a “wait-and-see” approach was popular, but according to organizations like the First Words Project, intervening without delay greatly increases a child’s chances of improvement. Age ranges for milestones vary, but if you notice your child is lagging behind (our BabySparks program has a great tool for tracking this), talk to your pediatrician or a pediatric developmental professional. The marvelous takeaway from all of this is that your child’s brain is literally in your hands! Interact with him, play with him, and teach him, every chance you get, right from the start.